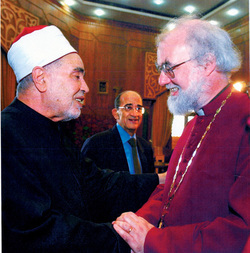 Al-Azhar Al-Sharif would like to welcome His Grace, the Archbishop of Canterbury and his accompanying delegation, and HE the U.K.’s Ambassador to Cairo, as well as his accompanying delegation, and we hope that you will convey our regards to Dr. George Carey, the Former Archbishop of Canterbury, with whom we have previously exchanged visits in London and at Al-Azhar. Today we have the Permanent Committee of Al-Azhar for Dialogue with the Monotheistic Religions that is presided over by the former Undersecretary of Al-Azhar and Dr. Aly El-Samman. We believe that dialogue and meetings are important for making contact and becoming acquainted with others for the sake of mankind. We also believe that dialogue is the best way to avoid wars and conflicts, as well as other issues that generate corruption and destruction in human society. We strongly believe that we are witnessing a time during which wars do not attain the desired goals, for wars have now become highly sophisticated. Your Grace is well aware that today, a powerful party can totally destroy a city or a village by pressing a button. The monotheistic religions were endowed upon humanity by Allah (the Almighty) and the prophets have preached its teachings for the pleasure of mankind and not its displeasure or affliction. Moreover, the name of the religion of Islam is derived from peace (Al-Salam), and among the more than one hundred holy names of Allah is the name Peace (Al-Salam). Many Muslims are named Abdul-Salam, servant of peace. The religion of Islam extends its hand to everyone sharing peace with it. Our greeting upon meeting each other is “Al-Salmu-Alaykum”, meaning “peace, security and stability be upon you.” We also find that among the basic tenants of Islam is to provide security to whoever visits us. In Islam it is taught that if someone visits a Muslim country legitimately and legally, the host country becomes responsible for the safety of that visitor. The Holy Qur’an orders us that if someone visits us we are responsible for the security of that visitor until he returns to his own country. Islam also orders its followers not to attack any person except in defense. Thus, the sharia (law) of Islam is the sharia of peace, security and stability. The defamatory representations by those who know nothing about Islam is incorrect. Anyone who associates Islam with terror is making false accusations and we as Muslims say it clearly. Terror, in the sense of attacking others, is a religious and a secular disaster. Events taking place in Iraq, such as the hostage-taking of journalists or security men or even ordinary drivers who went to Iraq to earn a living, and the killing of a group of Nepalese laborers. All of these are grave crimes. Those criminal acts, whether committed against Muslims or non-Muslims, are denounced by Islam, as well as by all other religions and all balanced human minds. This particularly holds true in the killing of young children such as during the tragedy in Russia when a school was attacked and innocent teachers and students were killed, innocent people who were in no way concerned with war. We would like to make it clear, that Islam is a religion of peace and security, and that jihad was only allowed by Islam in two basic cases: first, for the sake of defending one’s self, home, land or honor; and second, for the sake of helping the oppressed, those who have been subject to an attack against their nation, or religion, or honor, or home. Therefore, those who confuse terror and jihad are totally mistaken. I’m sorry to say that in Europe and the United States of America, there were some who offered shelter to terrorists and even assisted them. They know nothing about Islam and although they speak in the name of Islam they don’t understand it correctly. I say they were offered shelter and were believed by some, not by all Europeans and Americans. That is why we advise you to understand Islam through those who really know and apprehend it correctly, for among the basic tenants of Islam is clarity. We extend our hands to everyone who shares peace with us, but at the same time, Allah, the Almighty, has permitted us to fight against anyone who attacks us. This is Islam in two words, to be peaceful with anyone who shares with us peace, and to fight against anyone who attacks us. The difference between jihad and terror is like the difference between the sky and the earth, for both are two contrasting elements that never meet. Those who defame Islam by describing it as a religion of terror, are either ignorant or saboteurs. And anyone who commits a crime such as hostage taking, kidnapping or killing innocent people, and then alleges that he is a Muslim, is rejected by Islam, which does not approve or condone his criminal acts. I sincerely hope that you understand these facts, and publish them in Europe and the United States. Say to those who are accusing Islam of terror, that it is blasphemy and a false accusation.